A great, full-featured super automatic with a small footprint, ideal for home use. Recommended for: Anyone who loves both coffee and convenience, and can afford it. Are you a coffee aficionado? Do you love the idea of being able to brew all your favorite specialty coffee drinks from the comfort of your home, any time you like, but don’t want a big, bulky, cumbersome machine? If you answered yes to either of those questions, then you’re going to love our Delonghi ESAM3500 review. 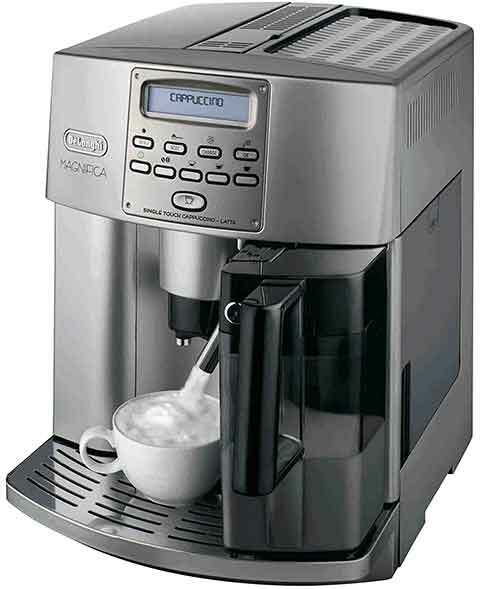 In the sections that follow, we’ll take a detailed look at everything this deluxe coffee machine can do, and draw your attention to a few of its shortcomings, so you’ve got all the information you need to decide if this is the right one for you. Let’s get right to it and see what makes this model tick! The Delonghi ESAM3500 is a super automatic coffee machine that comes to us from Italian maker Delonghi. It’s the big brother of the ESAM 3300 (insert link to that review), and part of the Magnifica family of super automatics offered by the company. As such, it bears a lot of similarities with the 3300, but also, offers some important upgrades, some more successfully implemented than others. Like its little brother, the 3300, the Delonghi ESAM3500 coffee maker has a surprisingly small footprint, measuring just 15”x11”x14”, and weighing 30.8 pounds. This is one of the 3500’s great selling points, and proof positive that big things sometimes come in small packages. It’s a crucial feature since most people don’t have excessive amounts of countertop space in their kitchens. Let’s face it, aesthetics matter. If you’re interested in a great super automatic coffee maker, then you want one that looks good and is going to blend in well with your existing décor. The Magnifica 3500 is well-served in this regard by its sleek lines and European styling. Its brushed silver finish makes it an attractive addition to almost any kitchen, and its small size means that you won’t have any trouble finding a good home for it. This is a hallmark of the Magnifica line, and our Delonghi ESAM3500 review wouldn’t be complete without calling special attention to it. If you’re a power coffee drinker (a pot or more a day), one of the biggest drawbacks of machines like this is the fact that they’re not designed to brew by the pot, but rather, one or two cups at a time. Worse, some super-automatics have tiny water reservoirs, which means you have to refill them regularly to get the kind of volume you’re looking for. 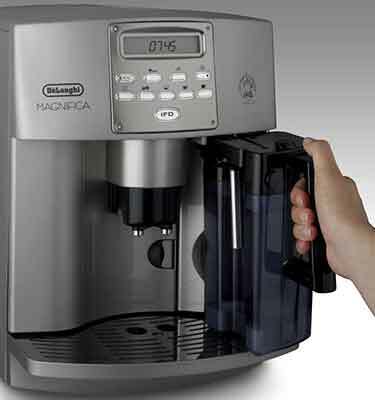 The Magnifica 3500 solves this problem nicely by offering an easy-access, front-loading sixty-ounce reservoir. Even better, the machine will dispense up to 8 ounces of coffee at a time, twice that if you order a double, so sixteen ounces at a time. That, combined with the generous reservoir size makes it pretty compelling, even for the most diehard power drinkers out there. One of the great things about the Delonghi Magnifica ESAM3500 is the fact that it’s got an integrated bean grinder, so that’s one less appliance you need to buy separately and find counter space for. The hopper holds just over seven ounces of beans, but as with most other super automatics, this machine doesn’t do well with oily beans, so you’ll want to find a good medium roast for optimal results. One thing to note here and this is a weakness of the entire Magnifica line is the fact that the grinder is unaccountably loud. That was acceptable in the lower priced 3300, but for the extra money charged for the 3500, we count it as a weakness and wish they’d found a way to keep the noise to a minimum. It’s not a deal breaker by any means, but be aware that as grinders go, the 3500 is louder than usual. The quality of your grind matters very much in terms of how your coffee ultimately tastes, so you’ll want to do some experimenting here to optimize the system to your preferences. In general, you want a finer grind for espresso and a coarser grind for a less robust cup of coffee. Again, each person’s tastes and preferences are different, so you’ll want to experiment! N​ote: This machine also has a bypass doser and includes a scoop if you’d prefer to use ground coffee rather than beans. It’s convenient, especially if you’re looking for a quick cup of decaf in the evenings, but in practice, if you’re a coffee aficionado, you’ll probably wind up not using it much. Still, its presence adds another layer of polish to the overall design. The 3500 has a double boiler system, which takes about five minutes to pre-heat. Once it’s ready to go, you’ll be able to enjoy a steaming coffee creation, just over a minute after that. This is one area of significant improvement over its less expensive brother, the 3300. While the 3300 also offers a double boiler, it isn’t capable of steaming milk and brewing coffee at the same time. The 3500 solves this problem, allowing you to do both, which is part of the reason for its increased cost. This is mostly a convenience feature, allowing you to position the coffee spigot to accommodate a variety of cup sizes, ranging from a small shot of espresso, all the way up to a standard 12-ounce cup. Note that the maximum size of a single shot is 8-ounces, which obviously won’t fill the 12-ounce cup, but that leaves ample room for milk and other ingredients you may want to add. ​From a brewing perspective, the spigot’s position matters in terms of your final output. For a creamier consistency, be sure to place the spigot close to the edge of whatever size up you’re using. 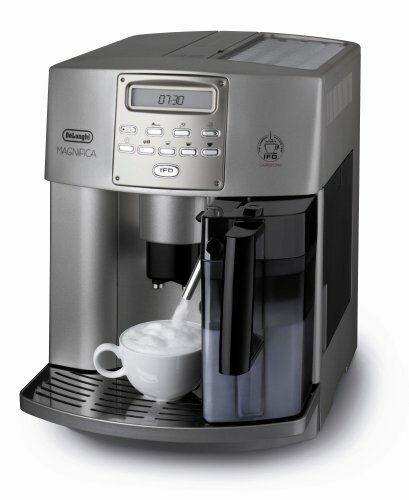 The 3500’s cappuccino system represents a significant upgrade from the 3300. Where the cheaper unit utilizes a simple steaming wand, the 3500 features an integrated system with a 25-ounce front-loaded milk jug that can be easily removed for storage in the fridge. The steam/froth unit descends into the jug when it’s locked into position and creates all the froth you could ever want. If you need hot water, say, for making a cup of hot chocolate, it’s as simple as removing the milk container out of the way and dispensing whatever amount of hot water you need. In our view, this is a superb feature implementation, and one of the strongest points of the 3500’s design. One of the secrets to a great cup of espresso is proper pressure. Espresso makers measure pressure in bars, and one “bar” of pressure is equal to atmospheric pressure at sea level. 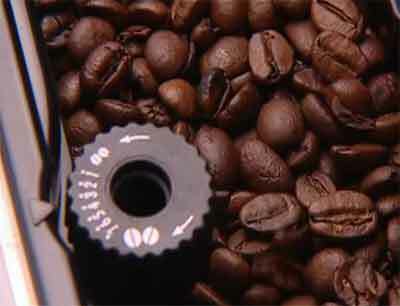 It takes at least 9 bars to make a good espresso, and the 3500 delivers fifteen bars, so you’ve got plenty of pressure, which will help guarantee excellent results every time you use your machine. This is important because if you’re used to drinking coffee by the pot, then you’re accustomed to having your coffee hotter than a super automatic will produce, and the Delonghi ESAM3500 Magnifica is no exception. Specialty coffee drinks are meant to be consumed at lower temperatures, and the because of that, if you don’t make use of the cup warming station (located on top of the machine), then you probably won’t be satisfied with the results. This is borne out by reading comments on various review sites. Many people who are unaccustomed to the operation of super automatics try to forego the cup warmer, and when you put coffee that’s not quite as hot as you’re used to into a cold cup, your results are underwhelming. The cup warming station then plays a pivotal role in a world-class cup of coffee, so don’t neglect it! As with the other super automatics offered by Delonghi, the 3500’s user manual is well-written and easy to understand, and although there is a learning curve to master the device, it’s not particularly steep. After the initial setup, you can be enjoying your first cup of coffee in mere minutes, though there are enough features here that you’ll be experimenting for quite some time to find your favorite settings. Since the water reservoir and milk jug are both front-loading, you can remove them for cleaning quickly and easily. The brewing unit is also accessible from the front of the unit, and the control panel features a descaling routine you can use to keep your machine buildup free and operating at or near peak efficiency. Proper cleaning is an absolute must for optimal results. Your milk frother and drip tray should be cleaned after every use, descaling every couple of months, and a thorough cleaning two or three times a year, at a bare minimum (this will depend in large part on how often you use the machine). One of the things that makes the 3500 easy to use is the fact that incorporates digital technology on the control panel, instead of using simple push buttons and knobs. The digital display will also inform you when the bean hopper and water reservoir need refilling, and when the unit needs to be cleaned, so there’s no denying that there are some compelling advantages by going digital. Having said that, we’d happily trade some of these convenience features for standard push buttons and twist knobs. Ultimately, when the computerized guts of the system breaks down (and it will, at some point), it turns your every expensive coffee machine becomes little more than a high-priced paperweight. Not good. Nonetheless, we understand that many people prefer digital technology incorporation, and if you’re one of them, then you’ll be even more excited by the 3500 and all it can do. 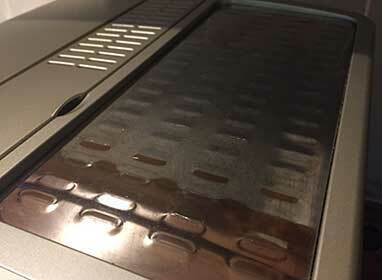 As you can see from our Delonghi ESAM 3500 review to this point, there’s a lot to like about this machine. From the generous reservoir size, the multiple grind settings, wide-range of features, and ease of use, this machine won’t let you down. There are hundreds of user reviews scattered all across the net by users who have been using their machines for years without problem or complaint. That said, there’s always room for improvement, and we’ll cover the 3500’s weak spots just below. First, is how loud the grinder is. This is a relatively small thing most of the time, but you have small children who sleep near where the machine is located, or if different people in your household are on different schedules, then the noise-level might give you pause. In our view, this is a genuine design weakness though, and in a machine that costs more than a thousand dollars, we feel more could have been done to minimize the noise. Second, the temperature of the coffee. This isn’t really so much of a weakness in the design, as much as it is a misunderstanding by those who use the machine. As mentioned earlier, it’s important to understand that the coffee the 3500 produces isn’t going to be as hot as coffee brewed in a conventional coffee maker. If it’s not hot enough for you, don’t forget to use the cup warmers so you’re not dispensing your drink into a cold cup. That solves the problem for the overwhelming majority of users. Third, there’s the digital technology. While most people regard it as a plus, we view it as a mixed blessing, at best, and would prefer strictly analog controls like the cheaper 3300 offers. Even so, we recognize that it’s a digital world, and most people won’t share our opinion. No matter how you slice it, the Delonghi ESAM3500 N is an excellent machine. It’s smaller than most super automatics, making it ideal for apartment dwellers, or anyone with limited kitchen space. Despite having a few shortcomings, none of them are terminal failings, making this an excellent, robust choice. It is more expensive than some other super automatics on the market, so if you’re looking for a value-priced entry, the 3300 would probably serve you better, but this one won’t disappoint! 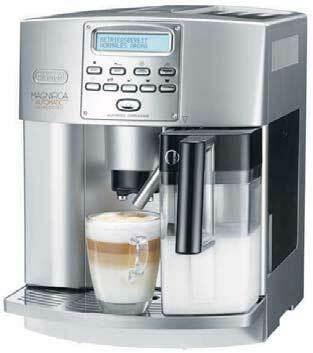 ​​De'Longhi ESAM3500 Quick Start Guide. ​​De'Longhi USA, Official Brand Website. ​De'Longhi USA, Official Brand Website. ​Coffee Nutrition Facts — Good for the Brain, Heart & Liver? ​Draxe.